This particular mother, though, was not going to give up so easily. Despite not having any money with her, she took a private taxi across town with her three children at her side and found her way to my office. She sat down in front of her children and me and begged. I couldn’t help but match her tears with my own. Her husband recently suffered from a stroke that left the right side of his body incapacitated and the home without a breadwinner. She has little supportive family in the community and is, as a result, left alone to take care of her husband and three children in an impoverished household. Her desperation brought her to TYO four weeks after our Core program began. My immediate response was a difficult denial not because it is difficult to integrate new kids in the program, but because we simply do not have the resources to enroll every child who wants to and needs to come to our center. But her persistence and her story made me realize that TYO is the one place where we can’t afford to say no. It may force us to have larger class sizes and we certainly can’t take in every child, but we have to try our best. Her kids, she said, are very shy and have no place to go in the refugee camp. They ask her each day why they can’t just be like the other kids in the world, why they can’t be children. These words from a three-year-old brought a mother to TYO, a place whose doors opened specifically for these kids who lack support elsewhere. In the end, we managed to enroll her two older kids in the program, but there are still children who need help, children who we can’t help. This is easily the hardest part of my job, and I don’t know if there is anything to be done. 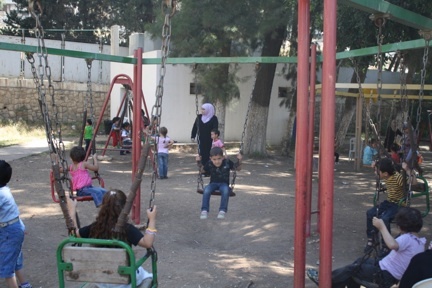 Suhad is the Psychosocial Program Manager at TYO Nablus. Field Trip to the Park with the Core Program! Last Thursday, the Core Teachers skipped TYO’s building and went straight to the park with their students. It’s was a beautiful day and end to a long week, so we all decided the kids could use some fun in the sun. They played on the swings, jumped around in the sand, and got some exercise. And, we ran around taking pictures of their experience. Here are some of them! “I’m so happy here! This is the first time I’ve been to a park!” said Sadeel, a 4-year-old. Sadeel wasn’t the only one who was new to the playful park experience. Some of the children weren’t sure what to do. Maid, for example, refused to play because he wasn’t sure what to do at a park until another child, Nihad, came to play with and help Maid. It’s great seeing the kids caring for each other, trying new things, and have fun! The kids loved to role play on the playground. Here is a little girl driving! We ended the day with some face painting. Kids requested flowers, butterflies, lions, cats, and even the TYO building! Eventually, the hours passed and it was time to go but the kids all expressed their excitement about another field trip to the park. It was a great day for the Core Program! Suhad is the Psychosocial Program Manager. 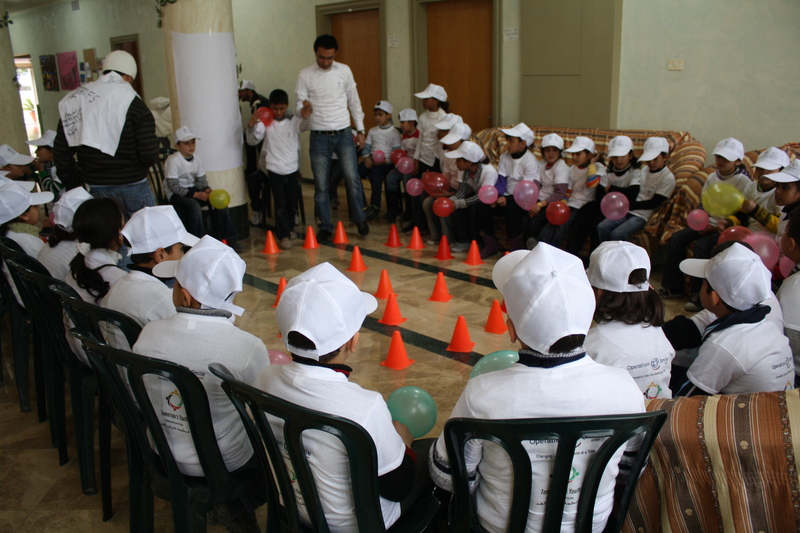 Over 80 children aged 3-5 from the Al-Mustaqbal School of Ramallah visited the TYO center in Nablus this morning, getting a chance to participate in some fun and educational activities with the Core Program teachers and TYO’s own morning program students. 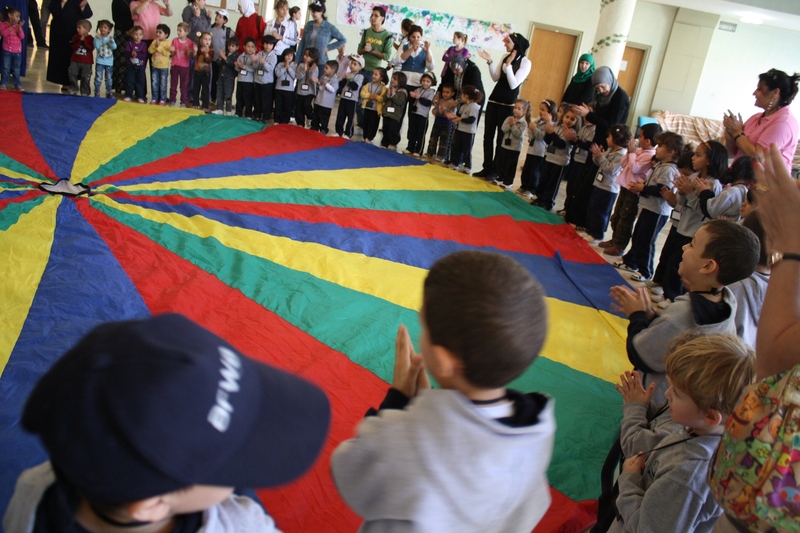 In addition to outdoor art activities, the children played with the giant parachute while getting to know the teachers and each other. 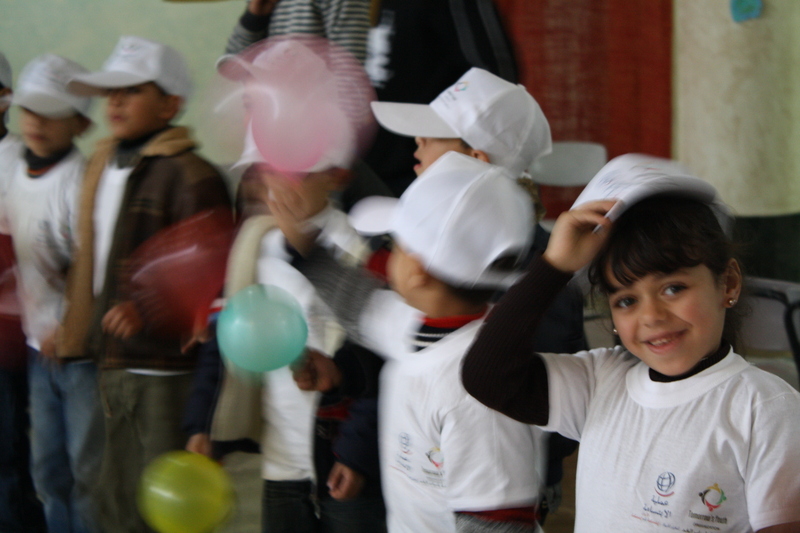 On Wednesday, 16 December 2009 Tomorrow’s Youth Organization celebrated the last day of its fall session in Nablus. 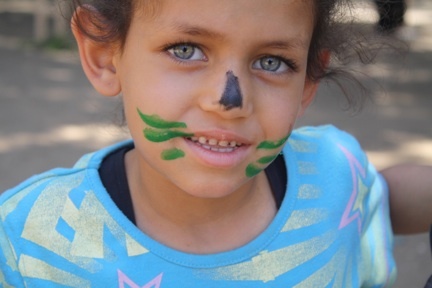 The children experienced an exciting array of activities offered by TYO, including art, sports and face painting activities. 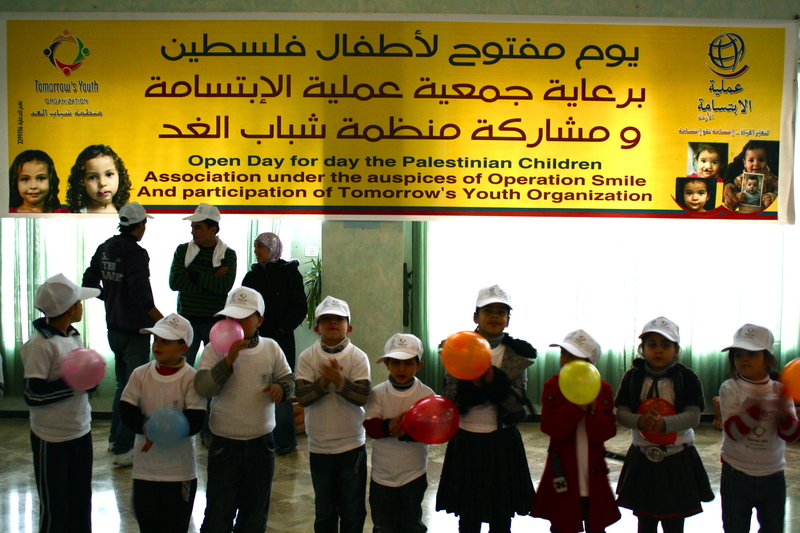 Operation Smile generously donated a hat, t-shirt and gift to each child and volunteer in honor of the last day. It was a beautiful celebration! Our devoted readers may be speculating “what’s happened?” Has TYO stopped running? Are they still at CGI ’09? Have they gone on vacation? No! In fact, we’ve been very busy getting several projects up and running, including our Fall 2009 Session which begins today! Things you’ve been reading about like the expansion of our International Internship Program and Triple Exposure (a photographic expression and public art project) have taken large strides in the weeks since our summer session ended. Today we begin again! Morning and Afternoon Core Programs! Women’s Class! Creative arts programming! Oh my! Stay tuned right here for program updates, photos of the day and early childhood education and development analysis! We will also come to you–don’t forget our our RSS feed–read our blog in your preferred format! The first day at Tomorrow’s Youth Organization (TYO) was a great success. 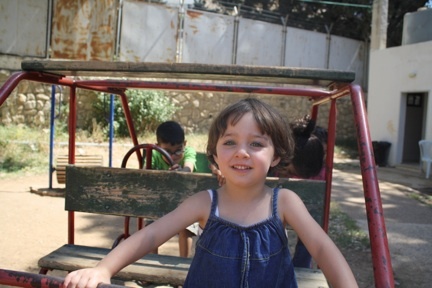 The Summer 2009 Session marks the beginning of a Holistic Integrated Approach to early childhood education within TYO’s program for early childhood development. Since the end of April, the Core Program teachers have worked with educators and trainers from MaDad to develop a program that encourages children to create their own environments, curriculum and goals. This child centered approach pushes the child to tell his own story at an age when he may not have an outlet for his voice. 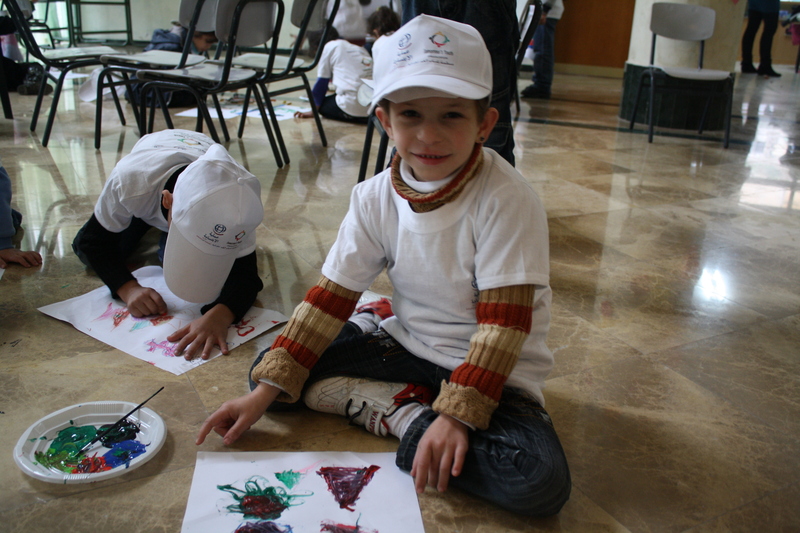 The program provides an opportunity for children to become protagonists in their own biographies, education and future. Additionally, the new approach in theory and practice here at TYO integrates families in conversations with the children to better understand, narrate, and expand their personal biographies and opportunities. Children at TYO educate themselves about subjects they choose and tell their own stories—a form of self-guided therapy. In a setting where psychosocial problems are the norm, their energy and resiliency is outstandingly evident. On the first day, the Core Program teachers and students focused on actively appreciating their new space. 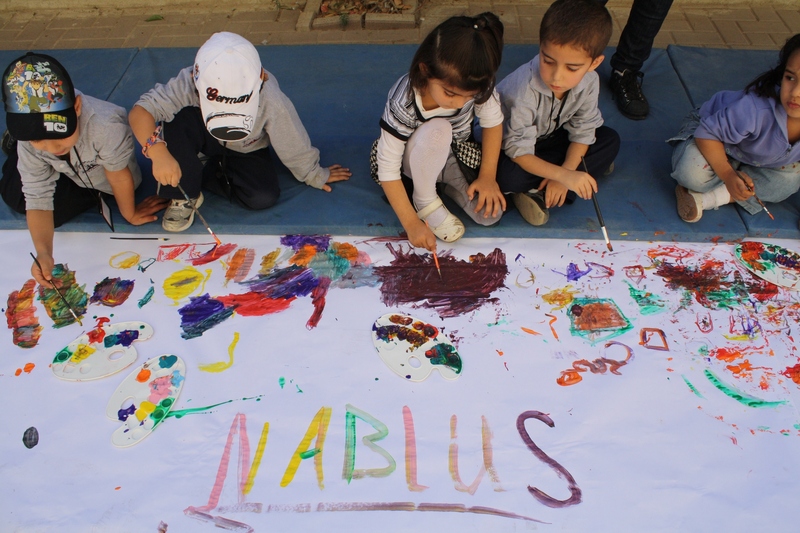 In order to teach the students about respecting themselves and their environment, the teachers began their classes with a cleaning activity allowing the children to take part in preparing the class for the day’s first activity. Likewise, at the end of the day the children cleaned their space as well. This practice of respect and responsibility for one’s environment instills in the children a sense of the classroom rules without lecturing or disciplining—it becomes second nature. I observed Ahmad’s class as he, his volunteers and the participants cleaned, decorated and learned about the space they will use for the rest of the summer. With in the influx of several American interns, TYO is able to offer lessons in photography, creative writing and creative visual arts to children and youth. The participants in these classes learn therapeutic skills that will allow them to tell their stories long after their instructors leave. Indeed, these skills are instrumental to TYO’s sustainable long-term goals of bringing their approach into the home. The children warmed up to the staff and interns quickly. They began journaling their experiences in Kelsey’s Summer Camp. In Doris’ “Nabulsi Explorers” class, students had the opportunity to tell their own stories by learning basics in photography and how to critique each others’ work. Shahla’s “Mad Scientist” class allowed students to draw subjects they wished to learn about in class. When a few students commented that they had never drawn before. All I could think was: What kind of future can a child who has never drawn before imagine? This is the true importance of TYO’s work providing children with the skills to represent themselves through documentation, visual and narrative arts. Danny is a member of the New York University chapter of Students of the World, a volunteer film crew, spending one month with TYO in Nablus documenting the first weeks of the TYO summer program.